Confession time (2nd week in a row!) ... I don't really like lentils. I am generally a very adventurous eater, and love almost everything, including basically all vegetables, spicy food, ethnic food, and some more uncommon stuff like hemp seeds and nutritional yeast. But lentils? Man, they just kinda taste like dirt ... MOST of the time. However, this salad makes me wanna holler, "gimme the lentils!" What's the secret? Fruity extra-virgin olive oil, fragrant parsley, a zippy double-take from red wine vinegar and fresh lemon, and c'mon y'all ... BLEU CHEESE. Pick your most favorite, high-quality bleu cheese for this one, and you won't be sorry. :) I hope you enjoy this salad that will please even the lentil-adverse. Bon appetit! 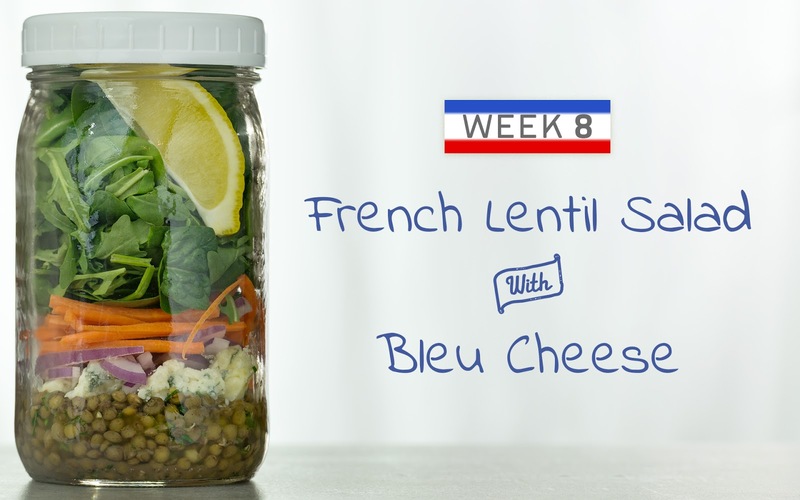 Make the marinated lentils: add the French lentils to a small saucepan and cover with an inch of water. Bring the lentils to a boil, then reduce the heat, cover, and simmer for 30 minutes. Drain, rinse, and cool the lentils. Add the vinegar, olive oil, salt, pepper, and parsley to the lentils, and stir gently. Pack the salads: divide the marinated lentils evenly among 4 tall quart-sized containers. Layer the bleu cheese, steak, red onion, carrot, and arugula in the jars. Add 1 lemon wedge to each jar. Refrigerate until serving. Enjoy your salad: invert your salad onto a plate or into a bowl. Squeeze the lemon wedge over the salad. 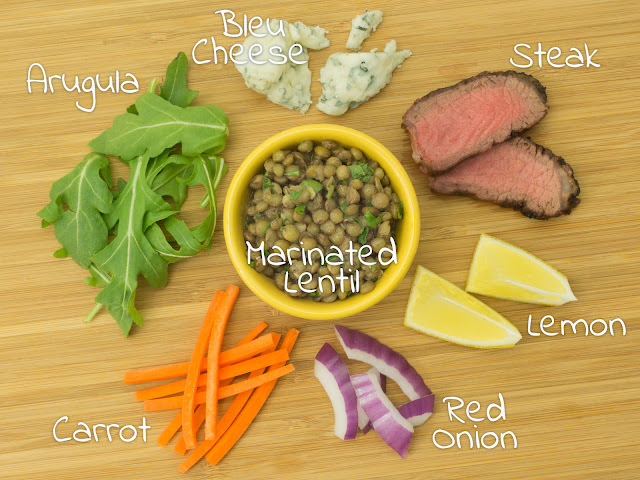 TIME-SAVING TIPS: Substitute 1 15-ounce can of lentils, drained and rinsed, for the cooked lentils. SPECIAL DIET SWAPS: For a vegetarian salad, omit the steak. For a vegan salad, omit the steak and substitute your favorite homemade or store-bought vegan bleu cheese or cultured tofu. This salad is gluten-free and nut-free as-is.